This map has been on the Steam Workshop for a while; I'm finally getting around to uploading it here now too. 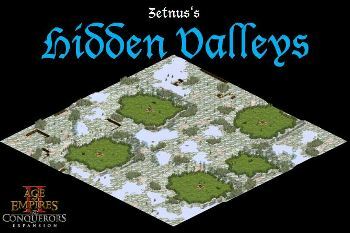 You start in a valley, surrounded by a thin line of trees in this hilly tundra-like map. The trees may provide some initial protection against drushes, but you will find that you need to cut through them soon to get resources from the outside world (especially wood, which is in low supply on this map). There can be valleys with no players in them as well. I've been contemplating this map for a while, and I think it provides a good counterbalance to some of the heavily forested maps I've made. If you like this one, check out my Desert Oases map - it's a somewhat similar idea, but in the desert. Resources are relatively standard on this map. AIs don't have too much difficulty breaking through the barriers. -More changes in distances to improve balance. -One unoccupied land will now always span in the center. This is a really unique map where controlling the map is absolutely required to guarantee victory. Since you only have enough resources to get your economy started, you have to claim for as many resources as you can or you will fall behind. I haven't played this map on multiplayer yet, but I assume a lot of battles for the rich "second spawn" (basically another lush grass area identical to where your town center is, but uninhabited) as it is a game changer. Really good eyecandy on this map. The lush grass to snow looked pretty good, especially with the addition of snow grass as a "transition" terrain. I had the most problems here. For one thing, on a rare occasion, sometimes only 5 sheep will be in your base rather than 6. This is caused by the spawn of the sheep in relevance to the tree wall, where one of the sheep spawn just far back enough that it was on the other side. This can happen with the boar too (particularly in the uninhabited lush area) where they spawn just far back enough to be on the other side. The AI is also a problem. It doesn't attempt to control the map until really late in the game, and when it does it doesn't go far. I have also ended the game with a drush because the AI cuts its wall down. This problem is not a map side thing though, just a stupid computer. I'm working on a couple of changes to ensure that everyone gets exactly the same starting resources and doesn't have boars or sheep on the outside. I will post an update with those changes at some point. You said you made a video - is available somewhere to watch?